Very nice Tim, VERY NICE! thanks guys ... playing with the deep etch trying to match food release like on a takeda ....muhahaha ...It is not sticky! Tim you do great work. Still playing with my petty, have not even strop it yet. Still sharp but I will be taking it down to 2-5k grit as I would like it to have a bit more bite. By the way everyone who sees this gives me high compliments on it, therefore you do get them as I tell them where I got it. Thanks Ron! That knife was a eye opener for me. A total new blade shape that was waay more useful than i thought it would be. I have two of that blade style ( a little bigger) ready to go in Nitro V stainless. I feel like at this point I am in the Homestretch for 2017. It has been a waay exciting year. I have finished the best knives I have ever made. 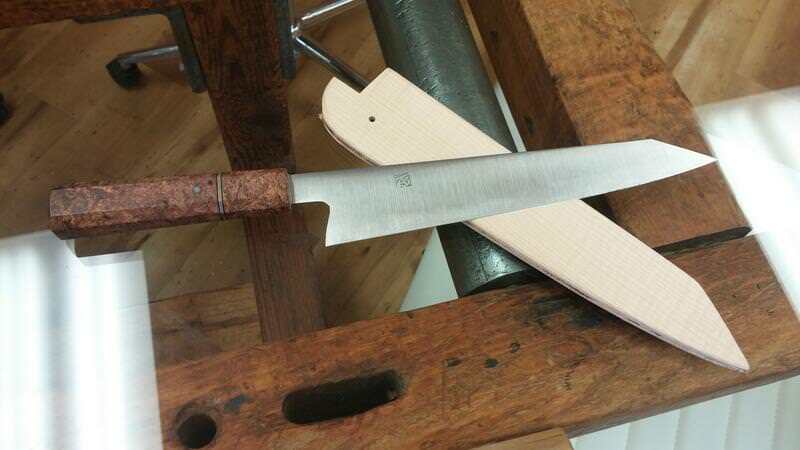 I have plans to introduce my own line of high carbon knives, in a 250mm and a 200mm format. The prototype will be going to a forum member here! I have some amazing commissioned knives coming up that I am so stoked to complete, most of them for forum members. So thank you all for trusting in me and pushing me to make a better knife. I have completed 24 knives so far this year and looking to hit 28 by the end of the year! The first knife I passed around on this forum was a 165mm petty in aebl steel. I ended up completing 5 of that design and selling them all. I took the feedback and added a little of my own personal preferences to come up with the next iteration this time in Nitro V steel @ RC63-64. Here is the first one complete with a large handle. The M3 composite material absolutely rocks as a ferrule, I will be using more. I am calling it the assassin model with a nod to jsgillis calling the first one a "nano-ninja"
Congrats on a great year so far! I love seeing your work, very inspiring! Totally dig the look of the edge profile and the long drop point on the pictured petty knife. Congrats on a great year TJ! This is the domestic equivalent of M390. The handle is Ipe Burl from Greenberg Woods. Ben has some excellent high quality stuff at all times. The background is a conference table made from 3/4" glass and a very old reclaimed transfer table for moving big maple boards into a giant swinging saw blade that was mounted to the ceiling. 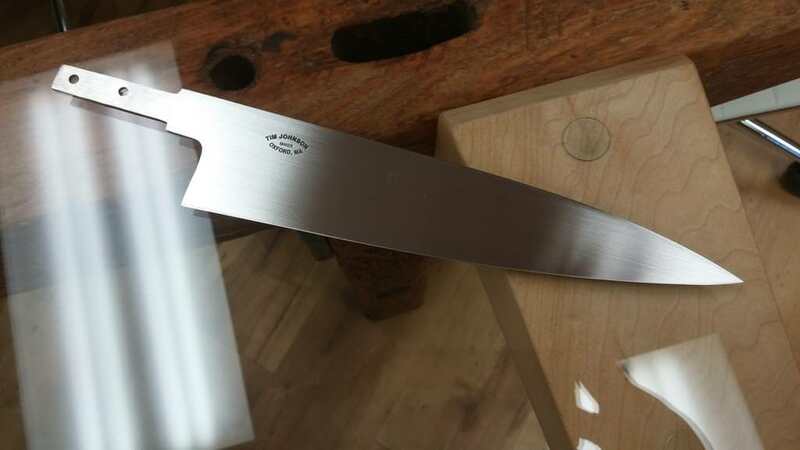 This knife features a full distal taper, 48" radius bevels, and edge convexed to zero. The Radius platen mimics the kind of geometry you would get from using the old very large diameter grinding stones. Wow that whole package is totally beautiful! 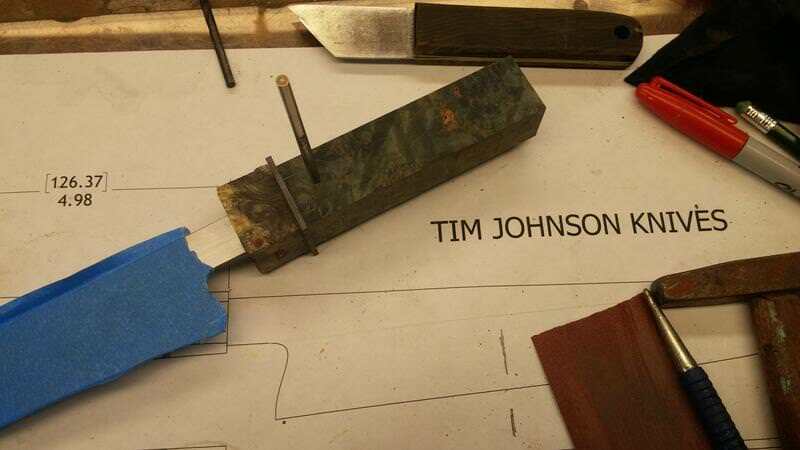 Great work, Tim! The latest is an absolute laser. 2mm at the heel, full distal taper, ground to zero and 15 deg. inclusive bevels applied. Just a couple strokes on my nubatama 150 raised a burr. Refined with shapton Pros from 320 grit to 2K then 5K, stropped on a 10K imanishi. scary sharp. Looking great Tim! 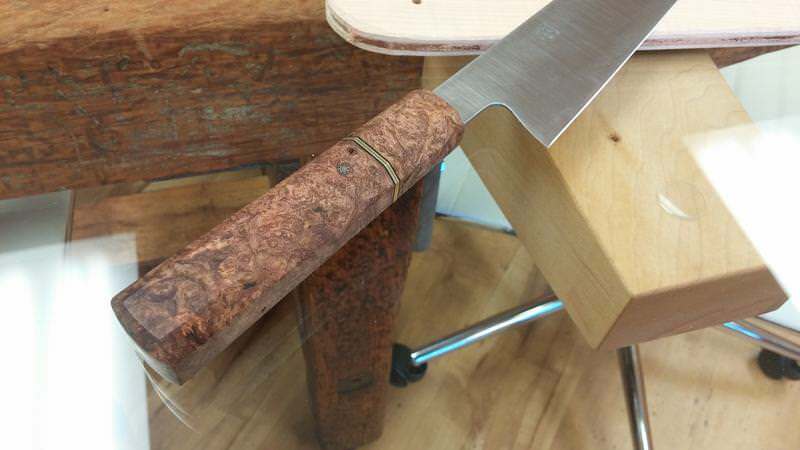 What is the steel used for the last posted knife? I'm beginning to get anxious! The hand finish on this latest one is beautiful... great looking profile too! 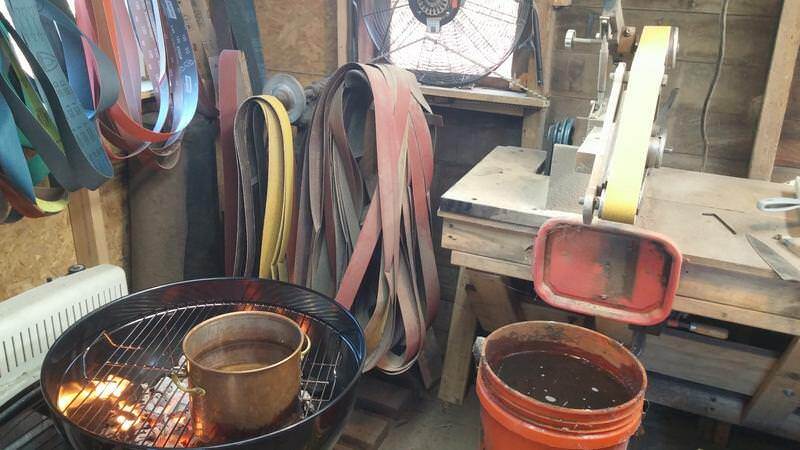 I will be sending my carbon steel blades for heat treat before christmas. W2, Vtoku2, Hitachi Blue#2, 52100, looking to finish these orders up in Jan/Feb. I have to see this sometime. 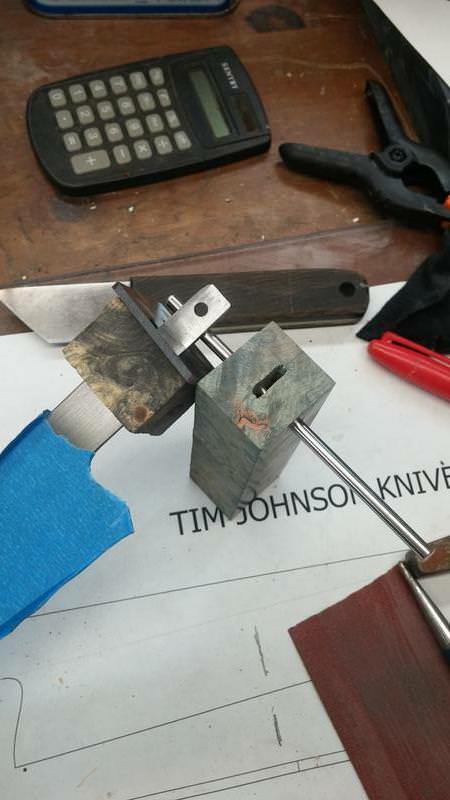 The amount of belts I go through is insane...Anyway, here is a handle I have fit and "locked in" The epoxy is curing right now, I will post finished pictures tomorrow. Tang is extra short on this one, the blade is a fairly narrow 210mm and verty light , the balance is still near the heel. Very nice Tim, haven't seen your work for a while, you are getting better everyday!